Electric Bird Noise scores a very short film. The sound is cinematic. Mournful and a bit sad, the pace is quite good. Due to the extremely languid development and focus on texture it remains rather large. What is done is so basic, so simple, and so effective. By bringing things down to the pace of molasses Electric Bird Noise appears to slow down time. For a release that is only five minutes long this is critical. What helps too is how Electric Bird Noises manages to keep the sound nearly exactly the same. Hence it is a unified coherent whole. Maintaining the same sounds makes it more enjoyable. Within this limitation Electric Bird Noise is able to extend the mood of the EP as well. Beginning with ‘Introduction’ Electric Bird Noise hits on everything, theme, melody, mood. The texture occasionally harkens back to a younger, more hopeful Warp Records. From ‘First Attack’ the attack is in first quite minor. In fact it takes a while for anything to quite happen as the mood is completely built up, paranoid, intense. ‘Back to Life’ is a calm, light airy track. By the time of ‘Final Attack’ things are obviously getting stranger. At this point the piece begins to come to a close. In the finale once more the theme is repeated giving the sense of a journey. That’s what’s so good about this EP. Everything is cyclical. By repeating itself it remains much larger than it would first seem. There’s nearly a psychedelic quality that makes this an appealing if a bit short journey. US project ELECTRIC BIRD NOISE is the creative vehicle of one Brian McKenzie, and on numerous productions released since 1997 words like ambient, cinematic and rock have never been far away when describing the material he release. 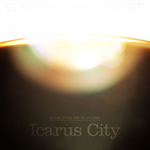 “Music from the Short Film Icarus City” is an EP from 2012 that was released on US label Silber Records as a part of an experimental series of EPs made under the condition 5 songs in 5 minutes. And I have to concur that the 5 minutes of music represented here really does come across as a fitting soundscape for just such a movie. Introduction is just that, with a sequencer foundation supplemented with surging dark synth textures and a nervous light toned constant on top in a manner that recalls Tangerine Dream. First Attack has the brooding nervousness only a dark drone supplemented with light toned surging textures can produce, with a nifty placed dramatic effect towards the end. Back to Life is a smooth construction with melodic rhythms and sounds that gives a distinct association to hospital machines. Final Attack/Another Drive Through The City has a more intense atmosphere with it’s starkly contrasting light and dark melodic rhythm effects supplemented by steady beats and surging futuristic sounds. Concluding part Main Theme/The Journey Home/End Credits is a slower, richly layered affair that features the elegant minimalistic theme motif coated in a rich smooth synth texture with slow rhythms and dark, melodic synth bursts that gives this one the vitality needed for a possible theme track indeed. A production that should be of interest to sci-fi movie buffs in general I suspect, with fans of artists such as Kraftwerk and Tangerine Dream a more than likely key audience from a musical point of view.